Franklin Matters: Franklin Historical Museum: Many happenings in December! Franklin Historical Museum: Many happenings in December! The Holidays are upon us which of course means Mrs. Claus will return again this year for her annual visit to the museum from the North Pole. She’ll be reading to wide eyed children from 11:00 AM – 1:00 PM on Saturday December 8. We’ll also have Kid’s Crafts in the museum library, all part of this year’s Holiday Happenings sponsored by the Franklin Downtown Partnership. Our Second Sunday Speaker Series continues on Sunday December 9 as Jim Johnston returns for part two of his talk on the Oliver Pond Home and his antique collection. Town Historian, former History teacher at Franklin High School and lifelong Franklin resident, Jim brings his vast knowledge and unique humor to his interesting and intriguing presentation which includes photos of the Oliver Pond Home interior and his beautiful collections. Doors open at 1:00 PM and the presentation starts at 1:15 PM. Our speaker series was such a success this year, we are planning to continue these interesting and informative talks for the upcoming year. Our schedule for the 2019 Second Sunday Speaker Series will be finalized and published soon. Holiday Christmas ornaments and 2019 Calendars are available at the Museum gift shop while they last. 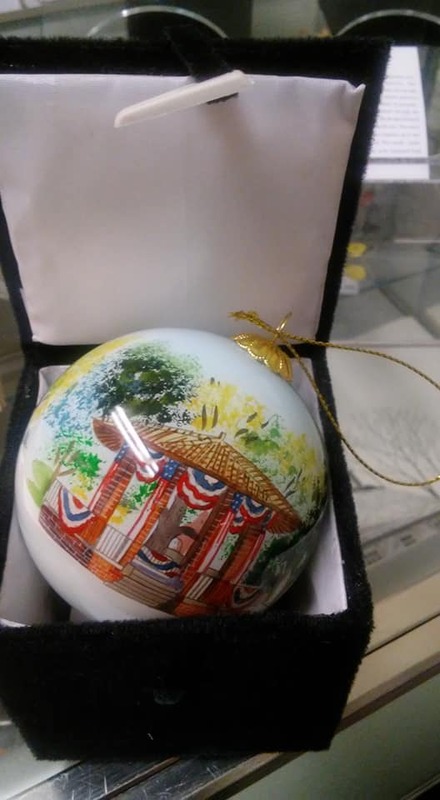 Choose from a Gazebo globe ornament for $15.00 or a Brick School ornament for $10.00. Each comes in its own handsome gift box. 2019 wall calendars, full of vintage photos from the Museum’s photo collection are available at the gift shop for $5.00 each. Proceeds benefit the Friends of the Franklin Historical Museum. The museum is located at 80 West Central Street. Our winter hours are Saturday mornings from 10:00 AM – 1:00 PM and Sunday afternoons from 1:00 PM – 4:00 PM. We are wheelchair accessible and always free. Come in and find your history. or on Facebook at https://www.facebook.com/FHM02038?